Authorities in Paris have taken the rare step of making public transport free for three days to reduce severe smog caused by unusually warm weather. 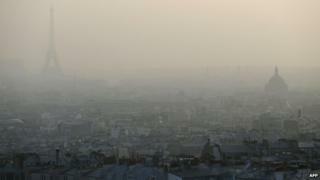 The French capital region and 30 other departments have been on maximum pollution alert for several days. Landmark buildings like the Eiffel Tower were barely visible after a white fog settled over Paris. The capital's air quality has been one of the worst on record, French environmental agencies say. A lack of wind, combined with cold nights followed by unseasonably warm days, has contributed to the worsening conditions. The smog has also affected neighbouring Belgium, where officials have reduced the maximum speed limit allowed on main roads. The southern Wallonia region said it had also decided to make buses, trains and underground trains free until the pollution emergency was over. Experts say levels of smog recorded in Paris this week have been similar to those of Beijing in China, one of the world's most polluted cities. As part of the emergency measures, commuters in Paris and neighbouring areas will not have to pay for public transport between Friday and Sunday. Bike sharing services are also free, as are one-hour sessions for electric car shares, the Associated Press news agency reports. French authorities appealed to drivers to leave their cars at home. "I am asking all residents in Paris and neighbouring areas to favour the use of public transport," said Jean-Paul Huchon, the head of the the capital's transport authority. He also warned that current pollution levels represented "significant risks" to people's health. The elderly, children, asthmatics and people with heart problems have been advised to stay indoors to avoid potential breathing problems. Environment minister Philippe Martin said air quality had now become "an emergency and priority for the government". The country's northern and eastern regions have been particularly hit by toxic pollutants. Several other French cities, including Reims, Rouen and Caen, announced they would follow Paris's example and make their public transport free over the weekend.